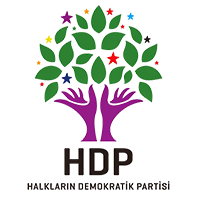 The Peoples’ Democratic Party (HDP) is the pro-Kurdish political party and the political formation of the Peoples’ Democratic Congress (HDK). It was established on October 15, 2012. The party represents the pro-Kurdish political line that has been active in Turkish politics since the early 1980's, which promotes Kurdish rights along with an agenda in left politics, although HDP is trying to present itself an alternative that can appeal to all the Turkish left. Its emblem is a green-purple tree on a white background.